With over 30 years of experience, we bring the knowledge and expertise for all your cleaning and building maintenance needs. We are dedicated to providing professional, responsive and innovative solutions while maintaining a sense of integrity and accountability to our clients. You have enough to worry about, let us clean things up. Whether it’s housekeeping or building maintenance, we can support your facility and make it shine. Need to clean up the outside as much as the inside? 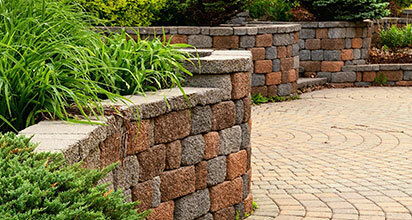 Let Custom Hardscapes reshape your landscapes and breathe new life into your outdoor projects. To provide a clean, safe and healthy environment while delivering on a commitment to exceed our customers' expectations. Aztec Property Services provides facility support and integrated environmental services for manufacturing and distribution facilities throughout the midwest. Knowing the industry, we understand the challenges – and we know that safety is priority one. Through effective planning and accountability, we deliver turn-key facility support services that address all possible issues related to your buildings, providing a hands-on alternative to help improve efficiencies, your product, and perhaps most importantly, the bottom line. 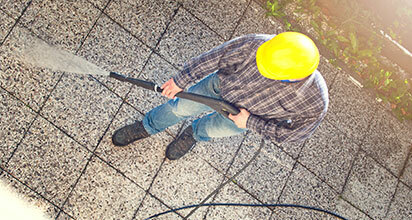 Aztec's commercial facilities cleaning programs are as effective as they are efficient. The results have been well-documented: where air quality and environmental hygiene levels go up, labor and healthcare costs, workers comp claims and maintenance expenses go down. By decreasing sick days, maintenance costs and health care expenses, Aztec can directly impact the bottom line in virtually any working environment. Think about it—if you could decrease employee sick days by just 1%, imagine the impact that would have on productivity. Clinical studies prove Indoor Air Quality (IAQ) is directly related to test scores, absenteeism and the overall quality of learning in schools. That's where Aztec comes in. We implement a unique cleaning program, specially designed for educational facilities. Our program utilizes ecologically friendly chemicals, microfiber tools and high-filtration vacuums that deliver superior results without harmful side effects to students, faculty or the environment. The result: When air quality and environmental hygiene levels go up, attendance and test scores follow. Research shows that in the first 30 seconds upon entering an establishment, a new customer forms an immediate impression of your business. Certain parts of the facility, such as restrooms, are especially important because customers relate the cleanliness of restrooms to the cleanliness of other parts of the facility. Presenting your customers with clean building maintenance will help you establish a strong first impression to your customers – and increase the chances of repeat visits. Aztec understands the unique needs of the healthcare industry and the demand for specialized facilities care. Aztec implements specialized innovations to maintain healthcare facilities including ecologically friendly chemicals to produce results without adverse risk to patients and staff and the utilization of the latest in microfiber cleaning tools. The approach is part of Aztec's holistic strategy for our healthcare customers—focusing on common touch surfaces, cross contamination areas and other high-risk locations. 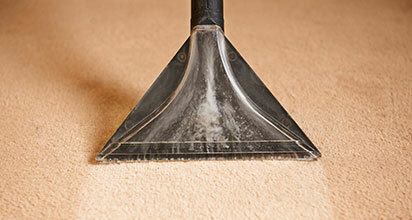 General housekeeping, carpet cleaning and extraction, strip and wax, floor care maintenance. Remodel, electrical, mechanical, plumbing, post-construction clean up. LED/Fluorescent installation, standard light maintenance and care. Concrete and asphalt repair, striping, sealing, snow removal, lighting. Lawn care and landscaping, irrigation installation and maintenance, chemical application, fencing, tree removal and planting.